The role and significance of dozens of the most significant battlefields and sieges in the story of the fight for Magna Carta are to be highlighted by The Battlefields Trust and The Magna Carta 800th Anniversary Commemoration Committee thanks to a grant by the Heritage Lottery Fund. The project will raise awareness of the battlefields and sieges associated with Magna Carta and the resulting Barons Wars. It will develop interpretation and educational resources to tell this story, including the development of an exciting battlefields trail that integrates with a nationwide Magna Carta trail. 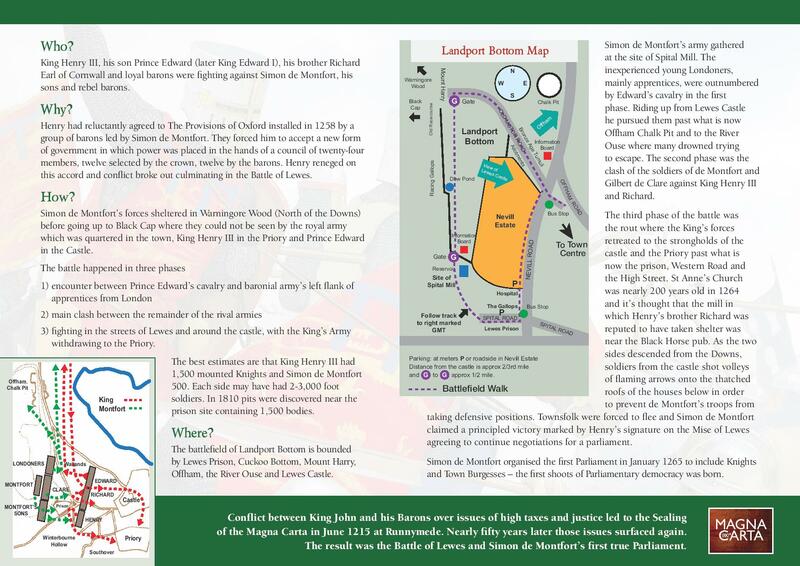 Look out for #MagnaCartaBattles for up-to-date information about this exciting project. Click here to read a list of Magna Carta Battles compiled by the Trust. Click here to download a bespoke Battle of Lewes leaflet (featured below). 10th: Lecture: Village Life at the time of Magna Carta. Dr. Nick Karn is Lecturer in Medieval Law at University of Southampton. The Cross Barn, Odiham 7.45 pm. Click here for more information. 16th: Lecture: ‘Magna Carta – The Great Charter of 1215’ by Dr Alex Armstrong. 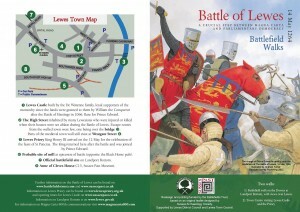 7.30 pm The Willis Museum, Old Town Hall, Market Place, Basingstoke RG21 7QD. Click here for more information. 27th: Friends of Hereford Cathedral Group Study Session and discussion event. Click here for more information.Edward Dawson of the Battlefields Trust will speak on the Magna Carta 800th Project. 28th: Lecture: The Magna Carta Wars, by Dr Matthew Bennett, Trustee, the Battlefields Trust 7.30 pm at Long Crendon, Thame. Long Crendon Preservation Society. Email [email protected] for more information. 1st – 3rd – Annual Conference of the Battlefields Trust, Oxford. Lectures will be given by Dr Matthew Bennett, Edward Dawson, and Magna Carta 800th Anniversary Committee Chairman, Sir Robert Worcester. Click here for more information. 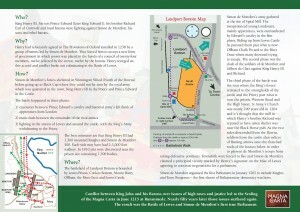 24th: Magna Carta Boat Rally: Colt Hill, Odiham with land-based attractions. Basingstoke Canal Society. Click here for more information. 27th Lecture: ‘The Battle for Magna Carta – a forgotten history,’ Edward Dawson, Magna Carta 800th Project Director. The King’s Chapel, High Street, Amersham Civic Society 8.00 pm.Contact Dorothy Symes at [email protected] 01494 434858, or click here. 13th: CPRE Hampshire Canal trip at Odiham, meet 2.30 pm Colt Hill Wharf, Odiham, Basingstoke Canal. Edward Dawson, Magna Carta 800th Project Director, will speak on ‘King John and Magna Carta – what it means today’. Click here for more information. 1-14th: 750th Anniversary Battle of Evesham 1265, Simon de Montfort Society and Battlefields Trust events series commemorate passing of Simon de Montfort and creation of first English Parliament. Keynote lecture by Professor David Carpenter. Click here for more information. 26th: Lecture: ‘The Magna Carta Celebrations and Odiham Castle’ by John Champion, Chairman of the Odiham Society. At the Allen Gallery, Alton at 8.00 pm. Contact: Sheila John 01420 82802. Click here for more information.